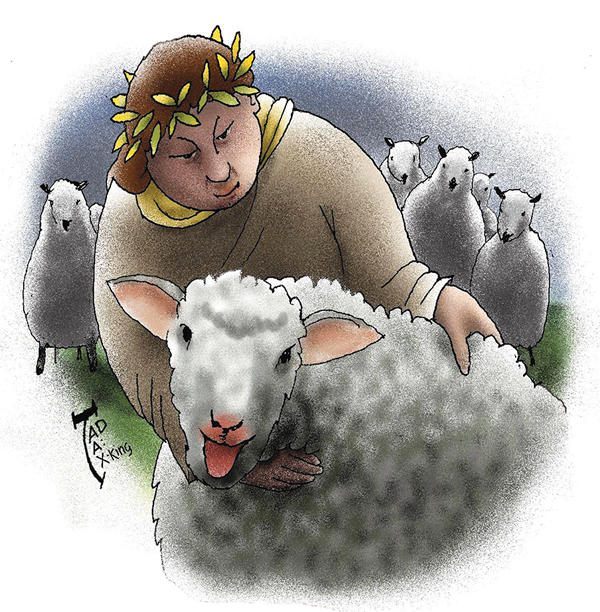 The correlation of the roles of king and shepherd precedes even the Old Testament. Akkadian, Babylonian and Sumerian texts, including the Code of Hammurabi, all invoke the king as shepherd. Clearly this association emerges from the pastoral context of the time, when sheep- and goat-herding were central to the ancient Semitic way of life. But there was something about the way a shepherd carried out his tasks that lent itself to comparisons to the political and spiritual realms, in which the king was the shepherd of his people and God was the shepherd of all humanity. Part of what made the shepherd-king imagery resonate is that sheep were not primarily intended for slaughter. Although sheep were food, their true economic value was found in their wool, a renewable resource. As a result, the shepherd was concerned not only to feed, care for and protect his sheep from predators but to increase his flock. So a shepherd had to know his flock intimately and had to protect the weak and the vulnerable in his flock from internal and external threats. Ezekiel 34 is a prophetic meditation on the false shepherds of Israel, who scattered the flock, with the result that the sheep “became food for all the wild animals,” and the true shepherd, God, who comes to rescue his sheep. God promises: “I will seek out my sheep. I will rescue them from all the places to which they have been scattered on a day of clouds and thick darkness.” God says, “I myself will be the shepherd of my sheep.... I will seek the lost, and I will bring back the strayed, and I will bind up the injured, and I will strengthen the weak.” Yet God goes on to add another duty to the shepherd’s job, saying “the fat and the strong I will destroy. I will feed them with justice.... I shall judge between sheep and sheep, between rams and goats.” Though Ezekiel does not identify the “fat and the strong” or tell us the criteria by which decisions are made, this judgment is clearly a part of the true shepherd’s role. Though God is the shepherd, Ezekiel also tells us that God “will set up over them one shepherd, my servant David, and he shall feed them: he shall feed them and be their shepherd. And I, the Lord, will be their God, and my servant David shall be prince (nasi) among them” (34:23–24). But while the coming Davidic servant is here called a prince, in Ez 37:24 God says, “My servant David shall be king (melech) over them; and they shall all have one shepherd.” Christians proclaim in Jesus the true king who brings together the divine and human as the good shepherd who guides us perfectly to our eternal home. What is remarkable about the judgment is how fully the shepherd aligns himself with his flock. The shepherd-king Jesus knows his flock so intimately and cares for his flock so intensely that he judges us by how we have sought out in solidarity the least of the flock. The true king is not a cruel despot or harsh overlord, but someone who asks only that we identify with those who are the weakest and the most vulnerable. The good shepherd asks us to live by following him. This article also appeared in print, under the headline "Follow the Shepherd," in the November 17, 2014 issue.